There are even bikinis in space. 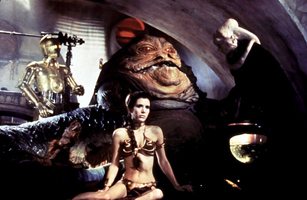 In 1983, Star Wars' Princess Leia Organa landed herself in custody of the gluttonous space varmint Jabba the Hutt and into curiously bikini-shaped shackles. Leia's metallic lingerie has since gained a cult following sizable to the films themselves. Made of brass, the Return of the Jedi costume was famously uncomfortable to wear and described as "what supermodels will eventually wear in the seventh ring of hell" by actress Carrie Fisher. The original "slave Leia" look is still paramount in the geekosphere and is often imitated by female fans at conventions  much to the delight of cosplaying Han Solos everywhere. See pictures of Carrie Fisher through the years.